Just a little somethin'-somethin' for Sassy Cheryl's challenge. This week we were to create a gift tag, card or box. I chose to go with the gift tag. I used "Bubblegum Disaster" digital image from Sassy Cheryl's. 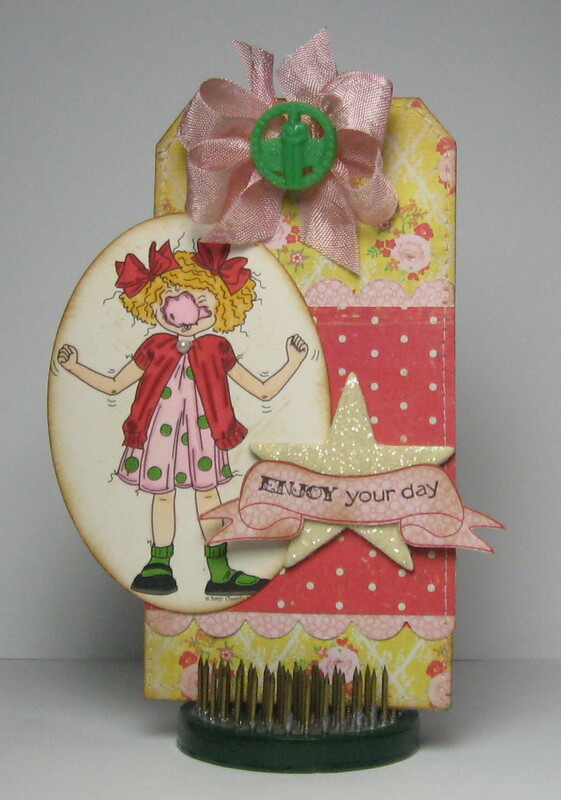 DP's from Crate Paper - Emma's Shoppe Collection. Diecut scalloped border from PTI, diecut banner and sentiment from Taylored Expressions, chipboard star from Melody Ross, glitter from Martha Stewart, Copics, misc. pearl adhesive, seam binding ribbon and a vintage button from my many travels. 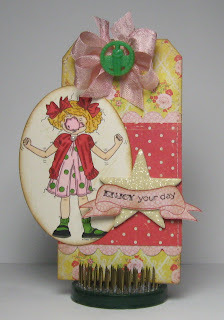 How cute is this darling tag, one of my favorite images and you colored it beautifully. Thahks for playing the Sassy Cheryl's Challenge. OMG look at all the details. This is fabulous Cathy! Ohhh this is so cute, and I love how the main picture is off center. Thanks for sharing with us and joining in at Sassy Cheryls Challenge blog. This is absolutely ADORABLE! So vintage and stunning! So thrilled that you joined in the challenge this week at Sassy Cheryl's. Just LOVE IT! How to cute is this.. what a great tag, colored just right! So glad you joined us for the Sassy Cheryl Challenge this week.